My slow cooker is one of the only pieces of kitchen equipment I tend to use seasonally. It’s used frequently in the fall and winter, usually for hot and heavy items like stews, and winds up taking a breather in storage from about May until September. Every time I use it, though, I amazed by its reliability and practicality. A few weeks ago, we took our annual family vacation to Fenwick Island, Delaware. The house we rent every year is fully stocked and comfortable, and we always have everything we need and feel at home. We tend to eat a few of our favorite restaurants while we’re there, but enjoy spending a night in to cook and have a large family meal. Usually, we have to leave the beach early, head home, and get to work in the kitchen. This year, things changed when my mom and I came across the slow cooker in a kitchen cabinet; we dumped our meatballs, sausage and sauce in it, enjoyed a long day in the sand, and came home to find a good portion of our Italian feast fully cooked. We used it a second time, that same night, to cook a turkey breast while we slept and, the next day, had delicious sandwiches for lunch on the beach. I quickly got over feeling a little foolish for discounting my most dependable tool and pulled out my slow cooker as soon as I returned from the shore. Since then, I’ve used it at least once a week to make plentiful dishes that are not only delicious but also easy to clean up. 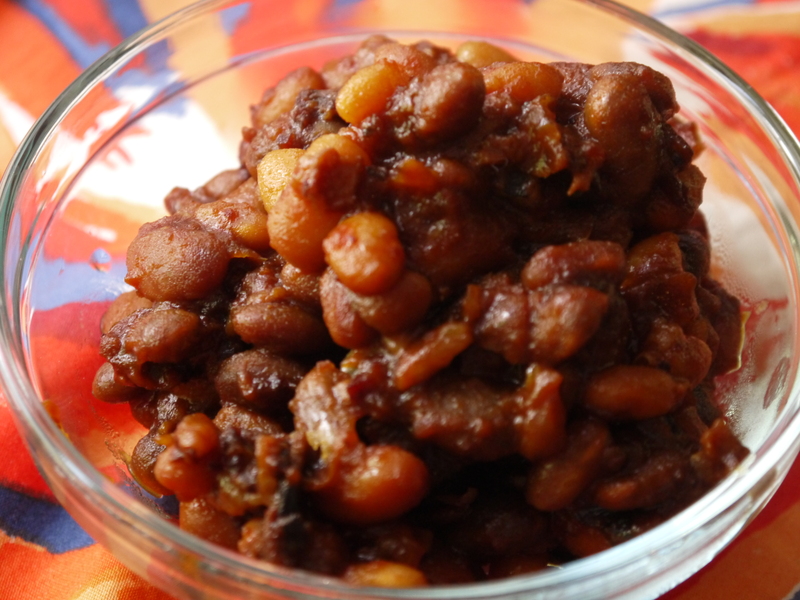 My favorite has been the popular summer side, baked beans. This recipe incorporates a dark, coffee flavored beer for an interesting spin on the barbecue side kick. 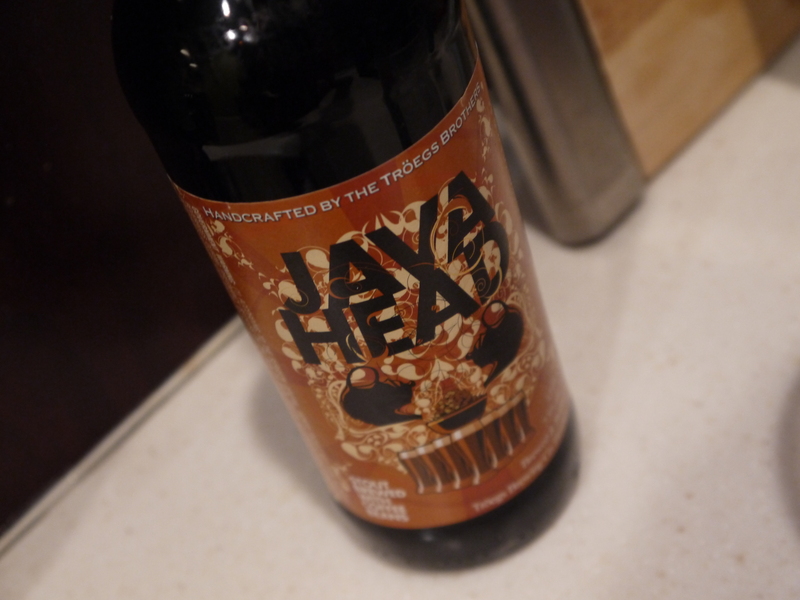 Troegs Java Head, the secret ingredient. The night before cooking, place beans in a bowl and cover with water. Allow them to soak overnight, for approximately 8 hours. Pour into a colander to drain, then add to the pot of a slow cooker. Cook bacon over medium heat until fat is rendered and edges are brown. Remove with a slotted spoon and place on a plate with paper towels to drain grease. Discard all but one tablespoon of grease from pan, return to medium heat and add onion and garlic. Cook until onion is translucent. Add onion and garlic to slow cooker with bacon and the remainder of the ingredients. Stir together and cook on low for 12 hours. Let me first apologize by presenting you with a recipe that takes over a day to produce, between the preparation of the beans and cooking time. Patience, though, is a virtue, and this recipe is worth the wait. Baked beans are known for combining sweet and savory, and this version follows suit. The spices and mixture of brown sugar, ketchup and molasses blanket the beans in what is essentially barbecue sauce. 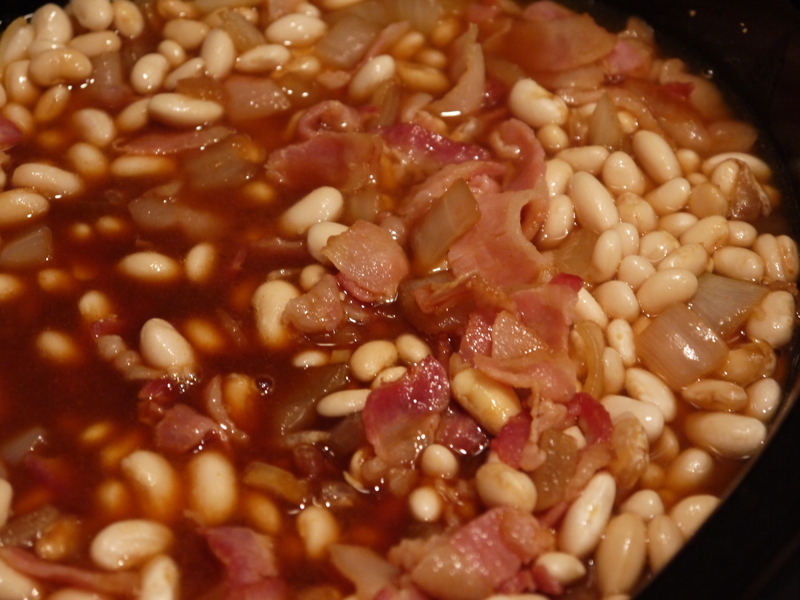 Smokey, salty bacon practically dissolves into the bubbling beans leaving remnants of the browned, crispy edges. While each ingredient on its own is powerful, let alone when paired together, the star of the show is the coffee infused beer. The deep roasted flavor enhances the saucy beans and is truly the star of the show. If you’d rather not use alcohol, a substitute of 8-ounces of coffee mixed with 8-ounces of water would work just as well, and would provide the same benefits. In the end, not only did I get the best baked beans I’ve ever eaten, I also reignited my love affair with my ever reliable, sturdy slow cooker. And, just like it, this recipe is delicious enough for year-round appearances.